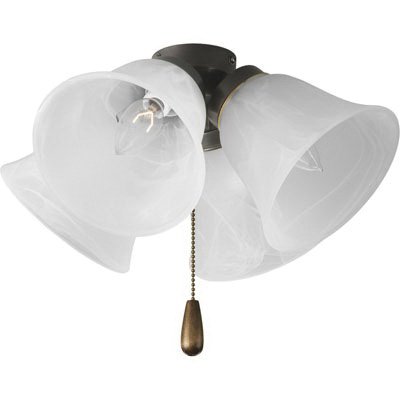 Progress Lighting AirPro Collection Universal fan light kit in antique bronze finish, features alabaster style glass shades for beautiful look. It utilizes (4) 40-Watt candelabra based incandescent lamps for energy efficiency, superior color rendering and long life. The kit includes antique brass pull chain with medium oak fob and offers quick connect wiring to any progress fan that accept an accessory light. It is suitable for great room lighting and/or bedroom lighting. Fan light kit is UL/cUL listed.